Sharpen your own cultural intelligence – and increase your professional effectiveness at the same time. Whether traveling abroad or working at home, professionals routinely face challenges when it comes to understanding the culture of others. When misunderstandings occur, relationships suffer. The good news is that cultivating cultural intelligence is a skill that can be learned, and Brooks Peterson tells you how. Packed with dozens of engaging stories, cases, and humorous contemporary cartoons by the author, Cultural Intelligence is the perfect antidote for overcoming cross-cultural differences, improving workplace communication, guiding solid business relationships, and contributing positively to your organization’s bottom line. 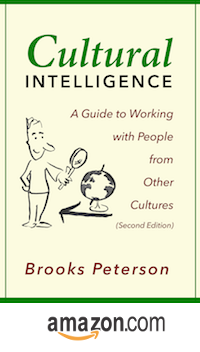 In this in-depth companion to the Peterson Cultural Style Indicator™, Dr. Peterson defines cultural intelligence and explores the skills and characteristics required to work effectively with international clients, customers, and business partners – or inside any team, department, or organization with a rich mix of cultural perspectives. Using a set of 25 professional- and business-oriented dimensions, the author helps you examine your own cultural style and determine that of others in six vital areas of style: management, strategy, planning, personnel, reasoning, and communication. The crowning piece is a suite of key action steps for increasing your own cultural intelligence. 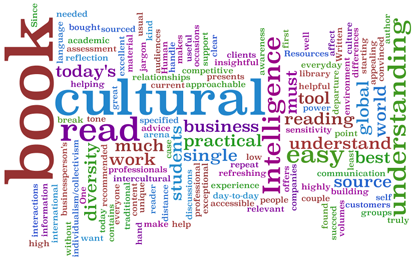 Building on the success of the bestselling original edition of Cultural Intelligence (Intercultural Press, 2004) this updated 2018 edition offers 25% more material, including reflection questions at the end of each chapter, updates for today’s digital world, and many improvements based on valuable feedback from professors and past readers. Other buying options: Cultural Intelligence: A Guide to Working with People from Other Cultures (Second Edition – 2018) is available from Amazon.com (or .au, .br, .ca, .co.uk, .de, .es, .fr, .it, .in, .jp, .mx, .nl) and worldwide from the independent bookseller of your choice. Ask for ISBN: 978-1-71-784840-6 (please make sure to buy the 2018 Second Edition – the original 2004 edition is officially out of print, but many used copies are for sale).